..because it’s my first 9/9 climb.. and because it’s my dream climb.. I was just overwhelmingly happy. Well, I just remembered Santiago, a character in Paulo Coelho’s best-selling book,The Alchemist.. Santiago fears pursuing his dream to make a pilgrimage to Mecca because he thinks he will have nothing to live for once he’s achieved his dream. I was just afraid that the very moment o f realizing the Sicapoo dream would obviously come to an end.. I may be able to climb it again but the moment of “first” would never be the same. Of course,I have other dreams to pursue, but as a newly-sprouted mountaineer, it’s just different. It’s just special..All I wanted during that time is a slow mo-effect of that very moment so that I would feel every split of a second. How dramatic. But this was exactly what I felt during our summit ascent. This was really a much awaited climb for me as this had been already set as early as August last year. And I couldn’t believe that it was materializing during that time. This climb was made possible by our organizer, Dennis Hisanan of Castle Mountaineer (and also my climb buddy as mentioned on my previous blog posts). I am indeed thankful of him. We’re a total of 8 mountaineers who did the Mt. Sicapoo Traverse via Timarid and Simagaysay including Joachim Beadoy - Castle Mountaineer Founder; Phoenix Custodio – Castle Mountaineer; Ceejay Custodio – Green Mountain Tribe; Jenny Tanedo –DLSU OC;Tere Rance- STMG; Brian Feliciano – Blue Mountaineer. It was a 3-day expedition. Day 1 was a jam-packed river crossing at Gasgas river. We were blessed by a very fine, sunny weather making a tolerable leg-level of water. I really enjoyed the hike and we even take some time to swim. After long hours of rocky riverside trek, we scaled a very steep, nonstop-like assault (Balbalitok). Every time I reached a peak, I could not rejoice because upon reaching the top, a continuous assault to another peak awaits. But the view is just relaxing and breathtaking and this part of the climb is what I enjoyed the most. I prefer assaulting than descending. My knees and legs endure more when ascending. We should have been setting the camp at Bubuos campsite, however, our organizer decided to set camp at Saulay junction as it would be a great relief if we instead take a rest and save the 1-hour trek to Bubuos on the following day (considering that we are carrying backpacks that day and on the next day which was the summit assault, we would be just carrying assault pack). By the way, as suggested by buddy Dennis, we should be carrying light packs for easier trekking, and so we didn’t use our long packs. Day 2 was the moment.. the summit day. It was another beautiful sunny day. We passed by a number of knife edge, both wide and narrow steep trail, but continuous assaults (just like of Akiki) and mossy forest (Bubuos, Balbalite,Pakpako, Matalindong).. and finally Sicapoo. I was truly amazed of the giant rock penguin perched on its summit.We were given a good clearing although the other side was already covered by clouds. The trail on the the second day, for me, was not that so treacherous (except for the knife edge)but the biggest challenge was, it would actually put your strength to the limit because of the very long trek and water source is limited. We arrived back at the campsite around 12midnight already, cool breeze added to the difficulty that’s why we couldn’t take a long rest along the trail. We set bonfire during our rest to warm us. Day 3 was a total challenge for me. This day was the much-awaited “uwian” mode. (I was so excited to eat a real ulam , not Ulalammm and Corned Tuna anymore, please!) The bad thing was, you’ll be going back to the campsite and yet you’ll still be climbing mountains. This day was the traverse via Timarid and Simagaysay mountains. Looking at Timarid from our camp site, I already foreseen a warning, we would undergo a not so easy assault, or let me say a difficult assault. It is an open, steep mountain. And yes, we actually did bouldering under an extreme heat of the sun, (I think that was before lunch). We stopped by a creek for our lunch by the way.. and then a continuous descent followed and it wasn’t favorable for me. I actually hit my left arm when I slipped on a trail descending Timarid. 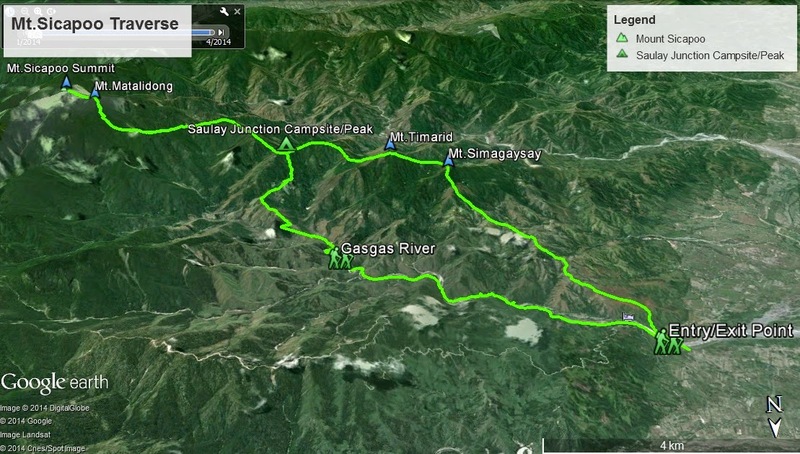 Trekking on Simagaysay is still a continuous descent however it’s not that steep like what we previously went through. And yet, It was really hard for me.. and for my knees..This was the time that I became out of focus. I hate that.. I fell down more and I realized that one would be facing a serious risk when he is not focused on the trail he’s walking at. I tried to calm down myself and thankfully I was able to be back to myself. A very long Batulao-like mountain followed. We witnessed the sun beautifully setting on the west. It was awesome. We passed by the One Degree plateau. The bridge marks the end of the trek. Around 8pm when we reached the jump off point. I’d like to salute Ma’am Tere for having that kind of patience and endurance so that she may successfully complete the traverse. And she did it! Thumbs up to all my companions for this successful expedition. I would also like to thank our guides led by Tatay Emilio who patiently guided us and to his family too for their warm welcome. I once dreamed of Sicapoo.. and it's not a dream anymore..
it was a blast.. it was extreme! It was another fruitful, fun filled and full of bonding hiking event for some of Lingkod brothers and sisters from Lingkod – Makati and Lingkod- Alabang (with some guests), organized with the help and support of buddy Dennis Hisanan. I was also grateful that I was also able to invite two of my special friends, Monique Cerillo and Len Faldas. Monique was a pen friend of mine back in high school (during those times that snail mails were in and e-mails/SMS were rarely used, hehe). Len is a close friend and former dorm mate and whom I also called “kapatid”. This mountain was their first summit and I was happy to see that they were able to make it to the top. We were so thankful for granting us a fine weather; really, we are blessed—not too sunny, although raining a bit from time to time and yet not a rainy/wet trek. Mt. Balagbag was an open mountain and we’re so grateful that we didn’t experience an extreme heat of the sun. Following the itinerary, we started the trek very early in the morning at around 7am. The jump off-point is kinda far from the city and thankful that we hired a jeep (Kuya Rey’s jeep as usual) and so, we didn’t have any problem or inconvenience in terms of transportation. We met Jefferson Aligato just a few minutes after the start of the trek, he was one of our companions in our Mt. Pulag Ambaguio-Akiki climb back in August 2011. Small world!! He said he was heading solo to Oriod( if i'm not mistaken). Talking about the trail, we went through a wide trail all the way to summit, although it’s a continuous assault. Even at the start of the trek , we can already see beautiful views. Mt. Balagbag as far as I know is part of the Sierra Madre ranges. I was so amused looking from afar at the silhouette of Mt. Arayat. I told myself, “Wow I was there July last year. Great to see it from here.” Our ascent was totally chillax. (no pressure, more rest and really relaxing). We just made ourselves feel the cool breeze, so refreshing! Finally, we reached the summit. It was a wide one signifying that it’s also the camp site. We spent more time taking pictures at the summit--Jump shots, multiple “kulitan shots, etc. After that short trek, we went down and stayed in one of the beautiful falls there, prepared and ate our lunch. We were very careful in going to that falls as we descended through a steep and slippery trail. Some of us enjoyed swimming (swimming?? Hehe) in its cold water, others just made use of the ample time resting beside the falls. Thank you Lord for this safe dayhike and for the great fellowship we had!